Mountainside Retreat is the ultimate relaxation destination. Private, luxurious and spacious living, whether indoor or outdoor. Inside is an open plan living area comprising of a dining area, comfy seating area with traditional hand-made iron sofas and chairs and an open fire centre piece. Additionally, there is a large roof terrace with seating from which to admire the spectacular views of the lush green rural valley and Patara beach in the distance. Outside is the magnificent pool terrace, all on one level, with infinity pool and Jacuzzi (for the sole use of villa guests), together with sun loungers, parasols hammocks, bean bags and other seating. Additionally, there is a wooden, pergola type, shaded outside area comprising bar, BBQ and dining area together with a traditional, slightly raised, cushioned seating area known locally as a Kosh (kirsch). Take a few steps down to the garden terrace and on down to the purpose built games room. Welcome! My name is Michelle and my partner is Mel. We have travelled far and wide in search for the perfect spot in which to spend more time. We discovered Islamlar with its breath taking views and unspoilt way of life and sophisticated Kalkan which is a short distance away. We realised we had found an idyllic place. In July 2011 Mountainside Retreat Villa was born. We love the area so much we then built a smaller traditional Mountain Villa ready for 2015! Ref: tk 4685. A haven to escape from the stress of everyday life. I also run Yoga Retreats at the larger villa with a special programme for deep relaxation and time out. Please enquire if interested. Please do ring with any queries regarding the villas! Mountainside Retreat Villa is set off the beaten track in a unique setting nestling into the mountains, which is why we chose it . Every window has a view of the stunning scenery, there is a sense of being with nature. Various forms of wildlife have been seen including a regular visit from a tortoise. We love the area because there is so much to explore from ancient ruins to quad biking or simply catching the sun rays at the famous sandy Patara beach. The villa has distant views of the sea at Patara. We can travel for miles without seeing other cars which is bliss. We feel the villa has the best of both worlds with its privacy and quietness yet a short drive to Kalkan and many other areas, we love this contrast. One of the benefits is complete privacy. It is one of the few villas can that boast an infinity/jacuzzi pool overlooking mountains, nature and a lush green valley, it is awesome! It has lots of space including 'head space' The villa lends itself to various ages from children/teenagers/elderly. The villa is suitable for young children and provides a high chair, cot and even a hand built in sand pit which is made from marble, some toys are also provided. There are various restaurants to choice from all nearby including our local fresh trout farm/restaurant which serves a lovely fresh breakfast and is open all day and evening. This is run by Ali's family (our manager and friend). He is also available for any queries, emergencies or just to help you settle at the villa. En suites to all bedrooms designed and built as wet rooms with shower, wall hung WC, wash basin with vanity unit mirror and light above. Master bedroom with corner Jacuzzi bath with shower over. All bathrooms finished exclusively in polished marble. We have a multi purpose cross trainer available for use in the Games room. Large open plan living area, the focal point being a marble and granite fireplace. Furnished with bespoke handmade wooden dining table and chairs, wrought iron sofas and armchair with deep comfy cushions. 42 inch TV, DVD player, satellite receiver. There are place settings for 20 allowing for use of the dishwasher. A comprehensive selection of crockery, cutlery, glasses (including plastic glasses for poolside use) is available at the villa. Modern fully equipped kitchen including oven, hob, microwave, dishwasher, American style fridge/freezer (with ice and cold water dispenser), toaster, kettle and electric juicer. Granite work tops and breakfast bar with handmade wooden bar stools. Large dining tables are available both inside the villa and outside for alfresco dining. Parking area, villa, pool and main terrace are all on one level –there is a ground floor bedroom ideally suited for guests with mobility problems. There are steps down to a further marble terrace, garden area and games room. Notes on accommodation: On arrival you will find a small complimentary welcome pack. We have also put together a “Mountainside Retreat ” booklet which provides: emergency contact numbers (English speaking), local supermarkets; restaurants; market days; barbers (a must whilst in Turkey! ), beaches and other useful information. Smoking is not permitted within the villa, but is allowed outside on the terraces. Within the villa all rooms are fitted with air-conditioning, which can also be used to heat the villa if required. There is an open fire place within the living area. We have obtained the services of 3 government accredited tour guides within Kalkan. They will be happy to advise on any guiding needs, from the informal quad biking and horse riding to the wonderful historical enlightenment of the Lycian legacy. The Villa is geared up to families with children. We provide a high chair, full size wooden cot, travel cot suitable for 0-3yrs which has a changing mat, cot mobile etc., There is a sand-pit. Outside: Stunning views down the valley towards the sea with Patara beach in the distance. Within the main terrace is the private large infinity pool and Jacuzzi together with a large selection of wooden sun loungers, easy chairs, bean bags and hammocks. Next to the main terrace (same level) is a large feature shaded dining area. Its similar to a Pagoda made from chunky trees with a bamboo top where we will eventually grow a vine. Within this is a marble bar with a locally made iron hanging space for glasses/sink/fridge. There is a large BBQ made from local chalk and a simple iron BBQ. A traditional Turkish shaded seating area,with carpetted cushions known as a “Kosh” is great for siesta! The village of Islamlar is a short distance away and provides bakery and shops together with several restaurants. Sitting by the pool a wonderful sunset can be seen, clear skies and many bright stars. From your balcony there are wonderful sounds from a variety of birds (useful to take your binoculars) Utility Room: Separate utility/store room on the roof terrace with washing machine, sink, ironing board and professional continuous steam iron. Storage area for bed linen, towels and blankets. Cleaning / Towels / Linen / Maid service: Towels and bed linen are included, changed weekly. The villa is cleaned weekly whilst the pool is cleaned daily. Arrangements can be made for additional maid services, paid locally. We can also arrange catering to suit, again paid locally. Other: The villa benefits from a large roof terrace, expansive pool terrace with an 11 metre infinity pool. The games room is equipped with pool table, air hockey, table football, cross-trainer and there is table tennis outside in the large shaded area. If you are looking for a peaceful, relaxing holiday then “Mountainside Retreat” is the place to be. Overlooking the village of Islamlar this property will provide you with space and luxury to spare with wonderful privacy. This is an exceptionally well appointed and managed villa and the owners attention to detail adds to this perfect holiday retreat. Many thanks for your kind feedback Paul. Our guests are most important to us so we encourage feedback to improve the high standard we aim for. We have a wonderful team there who help out with anything at all times which enables the smooth running of your holiday. I don't think I have the words to describe what a fantastic holiday my family and I had. The last couple of years we have toured around a little which meant me driving hours from place to place. It was time for a little rest. We decided we needed a relaxing holiday as we have two extremely sporty boys (8 and 14). A pool was a must plus finding a villa that would give us all some space. We found it...and more so. From the very point of booking, Michelle made things extremely easy. Any questions I had were answered very quickly. The drive from Dalamar takes about 90 mins and it was very easy to find Ali (as instructed). He then got on his scooter and we followed up to the villa. Oh my! What a view....what a stunningly beautiful place. To be honest, we weren't prepared for the whole thing. The boys.....straight into the pool. Glass of vino for my wife and I.Then came the sunset. Beautiful. The villa itself is tucked away down an accessible track, driving past...wait for it...grape vines, pear trees, apple trees, walnut trees and pomegranite trees. The first morning I got up relatively early, with the little one. Teenager obviously still in bed. I rolled up the kitchen blinds, to see a tortoise wandering up the drive. Then came the goats, a friendly wave to the herder, then breakfast. Not your usual start to the day. Islamlar itself is a very small hamlet, couple of very local shop/stalls plus restaurants dotted along the road at intervals. We enjoyed the one in the centre and even got picked up and dropped off. In terms of food and hospitality however, I would strongly recommend Adam's on the way to Kas. We had dinner here but breakfast is the real treat. Adam and his family are lovely and breakfast is something to behold! Worth the drive out of Kalkan. Michelle's villa is fantastic - one lucky lady to have it and if I am honest, a little jealous! We just need to work out when we will return! Many thanks Steve for your wonderful review of our Villa. We are very happy you had such a memorable time and we would love to welcome you and your family back anytime. We stayed in this incredible villa for a week in early June to escape the busy hectic pace of London life, together with my grown-up children. The view and pool were stunning, so relaxing, and I picked fresh apricots from the tree for breakfast (with permission!). The sounds of the goats climbing the mountain to their high pastures, the distant cockerels and the amazingly rich butterfly life were all highlights, as well as the comfortable hammocks and the ping-pong table where my son and I had many hilarious marathon matches. I will be recommending it widely and returning again soon. Many thanks for your feedback Diana and it has been a delight communicating with you along the way. I am so happy you had such a lovely break and pleased to hear you will be recommending the Villa. We stayed at this mountainside retreat villa during our 1st visit to Turkey. 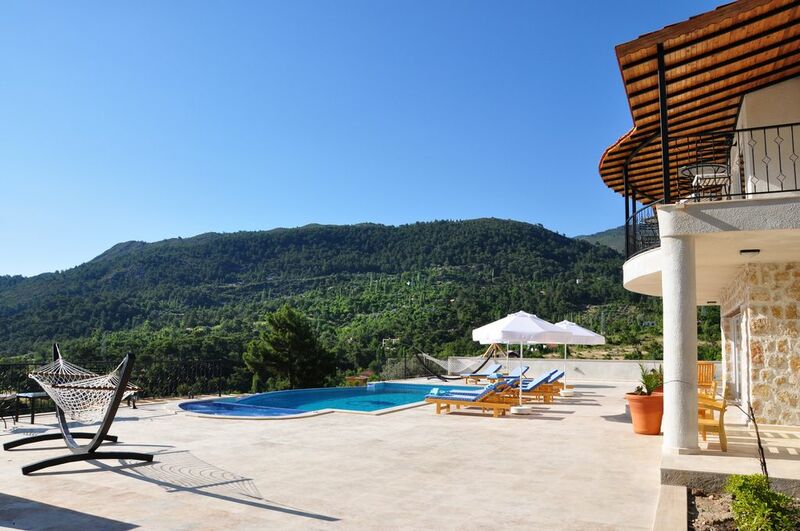 The villa is situated about 20 mins drive up the mountain from the small town of Kalkan which is on the coast. We can sum up in one word both the villa and our holiday in this area of Turkey - BREATHTAKING. The villa is lovely and large with everything a famlly of 7 (or more) requires to relax, unwind and enjoy. From the lovely pool to the amazing views at the villa, to the trips up and down the mountain and into Kalkan, this was quite simply the best holiday our family have ever been on. We will visit again when we come back here. Thanks to Michelle for helping us plan and get the most out of the holiday. Many thanks Mohammed for a lovely review and we are happy you had such a special time at the Villa with your family. It was good to communicate before your stay and answer your queries. It is paramount to us that we listen to our customers requests and improve the villa. We welcome you back anytime. We also have a smaller villa TK4685 which is further down the Mountain. Mountainside retreat really has the wow factor. Great location with stunning views. The villa itself was very clean and full of mod cons with some great extras like the games room! It's very spacious and the open plan living is perfect for a family holiday. We spent lots of time at the villa but when we did venture out found a lot to do. The restaurants in Kalkan are great as are the beach clubs. Kas is well worth a visit for a potter about and Kaputas beach is well worth the effort to get to, we did it with a 2 yr on our shoulders! We couldn't fault the villa- clean, well equipped and simply stunning location. Extremely spacious and luxurious and great attention to detail. The pool was great for young children and they enjoyed all the shaded areas around the villa itself. We visited some lovely restaurants in the local village which were a fraction of the price of the restaurants in Kalkan and provided a more authentic Turkish experience. Patara beach was magnificent and only a short drive away. The only thing to be aware of, which the owner states in the advert anyway, is that car hire is essential as all the local amenities are a drive away. Kalkan provides the usual array of water sports, including diving, snorkelling, daily boat hire and trips. Additionally, Islamlar lies within the historical Lycian area which boasts a rich and fascinating history. Within the area there are numerous historical sites to visit, including Kekova, Leetoon, Tlos, and Saklikent Gorge. Hamam/Spa: local small hotels provide traditional Hamams, including massage. There are market days in the local main towns with Fethiye’s on Tuesdays, Kalkan’s on Thursday’s, Kas on Wednesday and the local Akbel market on a Sunday. I am running Yoga retreats from the villa, a time to get away and leave any stresses behind. They are suitable for beginners-experienced. Please contact me for more information and dates. The area is blessed with spectacular beaches-Patara Beach is 30 minutes away; the idyllic Kaputas beach voted in the world’s top 20 by the Sunday Times is 20 minutes away, whilst Kalkan’s beach clubs are 15 minutes away. The nearest airport is Dalaman, an hour and a half drive away. An alternate is Antalya, some 3 hours distant. We can arrange your transfers to suit and car hire is strongly recommended- unless you wish to relax and unwind entirely at the villa and its immediate surroundings. Kalkan (right down to the harbour) 10 km. Kas is a 30 minute drive whilst the bustling shops and harbour of Fethiye is an hour away. There is a local small shop in Islamlar. In Kalkan (ten minute drive) there is a Pharmacy, good-size Supermarkets open all day until late. Banks with cash points, post-office which exchanges sterling into turkish lire. There are a few good restaurants in Islamlar and over 6o special restaurants in Kalkan. Some have tradional simple Turkish food . Some have sea/harbour or roof top views. We have found the waiters very friendly with excellent service. Booking Notes: CONDITIONS-BBQ must be left as found, if not, a cleaning surcharge of £50 will apply. When using the infinity pool children must be supervised. You use this villa and its facilities at your own risk and we strongly advice you to take out travel insurance. Visa from https://www.evisa.gov.tr/en/ Changeover Day: Monday is most popular as more flights then but may be able to adapt to your requirements. Booking Notes: Conditions: £300 deposit required before departure, refundable on return, as long as the property has no damage. Rental terms and conditions: A deposit of 25% is required to secure the reservation with the balance payment due 90 days prior to departure. Check-in time is from 15:00pm Check-out time 10:00am. This may be negotiable. Cancellation charges: Up to 12 weeks prior departure loss of deposit. Between 12 and 4 weeks prior departure loss of 50% 4 weeks prior departure loss of 100%.